But then more and more customers came up with the need to additionally integrate video into these scenarios. After all you want to see who is ringing before you open the door. So we decided to create such a solution. Audio and call management is – depending on type of equipment in use – either done the traditional way through an FXS interface or via IP. Audio calls are translated by OfficeMaster Gate (qualified by Microsoft as an enhanced gateway) to Lync protocols. To integrate legacy devices we use a video digitizer with streaming capabilities connected to the existing equipment. For pure IP solutions no separate video equipment is needed. As soon as somebody rings the door bell, the call is routed to the internal destination and at the same time a video window pops up in parallel to the incoming call toast. Even before accepting the call it’s already possible to see who is there. 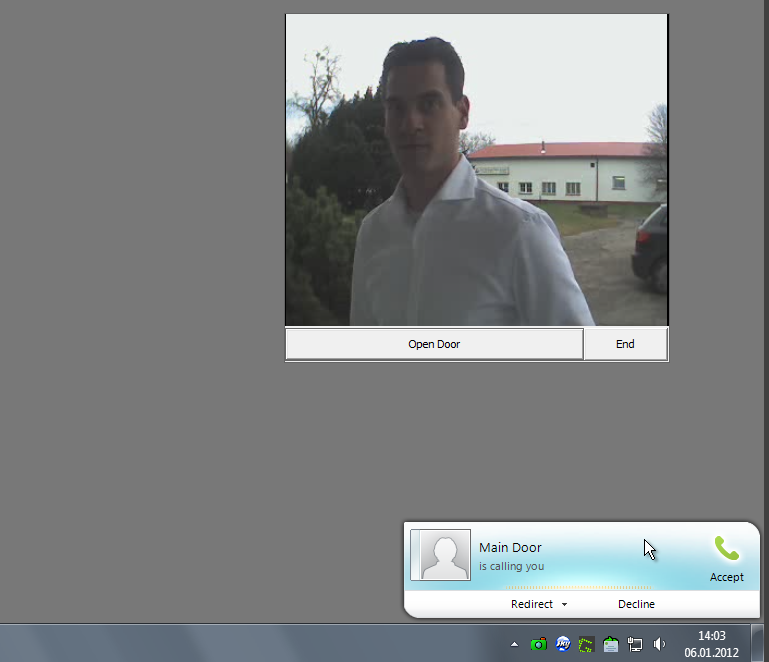 After some conversation the door can be opened by clicking the “Open Door” button – this also ends the call and closes the video window. Position of this window on the display can be changed anytime by moving around using the mouse. It is stored then as default for further calls. This entry was posted in Lync, Uncategorized and tagged analog, door, Lync, phone, video. Bookmark the permalink.